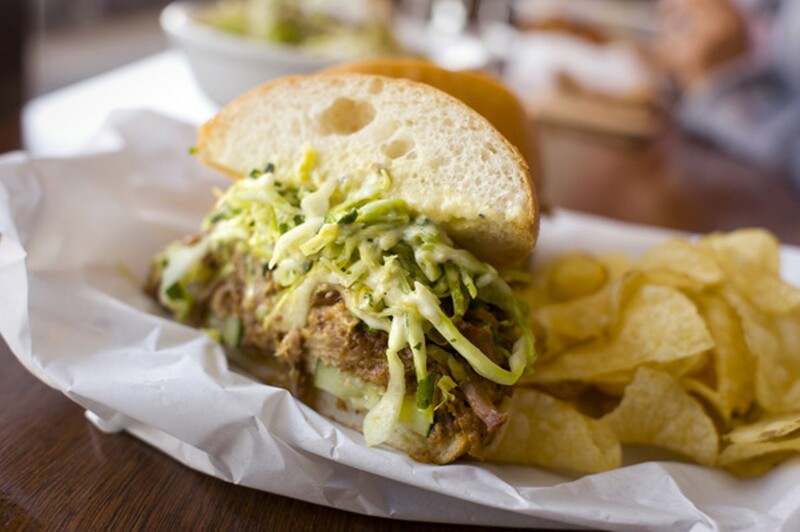 The Pulled Piggie is Southie's tastiest sandwich. Hours: Mon.-Sat. 11 a.m.-9 p.m.; Sun. 11 a.m.-3 p.m. Nothing could be simpler: Take two slices of bread, put something on top of one of the slices, put the other slice on top of that, and enjoy a mitt-size meal without the stress, silverware, or fancy sauces. But, like most seemingly simple phenomena, the humble sandwich can assume many forms: a last-minute snack, a knife-and-fork extravaganza, a lunchbox standby, a source of regional pride, an evocation of the past, a glimpse into the future — even a meaningful, soul-stirring culinary experience. True to form, we nosh-loving Californians have helped lead the charge into a brave new world of upscale, inventive, organic-sustainable sandwichship. (Tried Pal's Take Away's hangar steak, farm egg, celery root, wild arugula, and Tabasco mayo on Acme batard yet?) The field is cluttered, but some of the finest sandwich-scarfing in the greater Bay Area (a region already blessed with Cam Huong Cafe's barbecued chicken banh mi, the Swan Oyster Depot's smoked salmon on sourdough, the meatball on foccacia at Mario's Bohemian Cigar Store, and El Ojo de Agua's carne asada torta) is available at Southie, a classy new hangout/takeout joint on College Avenue. It's owned and operated by Rich and Rebekah Wood of Wood Tavern, the acclaimed brasserie next door famous for its Cal-Med soul food and artisan cocktails. At Southie, the Woods have downscaled things a bit, offering half a dozen sandwiches plus a soup of the day and a few salads in a space barely large enough to accommodate 24 diners. But despite the cozy informality, this is yet another one of those lively, unique, diner-savvy eateries that is making Oakland one of the culinary capitals of the country. Chef Morgwn Jones' sandwich menu changes frequently, reflecting whatever's fresh and seasonal, which in our lucky case meant Dungeness crab, the best reason to stick around the Bay Area in the winter. The house crab roll, served on a grilled and buttered bun, overflowed with sweet, succulent meat and just enough celery, aioli, and lemon to contribute a bit of crunch and spice without overwhelming the star attraction. A lustier option was the Nana Carmella, a baguette (from La Farine bakery up the street) packed to bursting with the biggest meatballs in our experience: light, fluffy, smoky orbs of ground-up Niman Ranch pork and beef, ribboned with onion and spice and draped with melted provolone. One especially imaginative sandwich balanced the earthiness of shaved fennel and marinated beets against the spark of citrus and scallions, the crunch of toasted almonds, and the puckery lushness of fresh chèvre to satisfying effect. 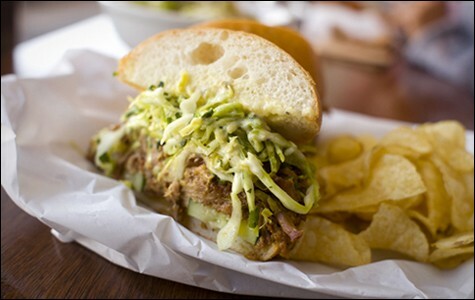 The Pulled Piggie was our favorite, though: au naturel Niman Ranch pulled pork so lush and tender it didn't need saucing, served on a nice soft Acme roll with a hint of aioli and subtly pickled crunchy cucumber. Southie complements its sandwich menu with a handful of starters, sides, and salads. Kicking things off were two elaborate crostini: one spread with ciccioli (purésed fatty pigmeat, and every bit as delightful as it sounds) and then topped off with a kaleidoscopic salad of carrots, tarragon, scallions, and hazelnuts, and the other layered with creamy garbanzos, marinated beets, tender greens, and a hint of lemony sumac. Our soup of the day was a rustic, winter-friendly bowl of tender white beans, smoky linguica sausage, and sweet, nutty parmesan. The house red potato salad was nothing special, but we loved the restaurant's version of salad Lyonnaise, a bushel of brisk frisée made absolutely palatable by shards of smoky bacon, a creamy-runny poached egg, radishes, scallions, and fragrant, earthy truffle oil. The name "Southie" refers to head chef Maximilian DiMare's Boston birthright, but aside from the Cape Cod potato chips that accompany every sandwich, the only overtly Bostonian item on the menu is pastry chef Sarah Ballard's marvelous whoopie pie, a dish claimed by both the Pennsylvania Dutch and the state of Maine but probably invented at the Berwick Cake Company in Roxbury. Ballard's version of the old devil's marshmallow-fluff standby exemplifies the restaurant's "East Coast Mentality, West Coast Sensibility" motto. Instead of day-old chocolate cake and sweet white goop, Southie's pie layers slices of moist, spicy carrot cake with a rich, puckery ice cream made of fresh cream cheese: It's carrot cake reimagined into something new and irresistible. A (rather forgettable) ice cream sandwich featuring two barely chocolate-y chocolate chip cookies and a scoop of vanilla gelato offers another variation on the house specialty. But the third sweet was anything but rudimentary: a big bowl of dark, bittersweet chocolate pudding accented with house-made marshmallows that were caramelized until crunchy-smoky with bits of bacon. On their own, the porcine marshmallows were downright weird, but mixed up with the silky, earthy chocolate and a dollop of whipped cream, their effect was striking and surprisingly pleasing, sort of like an upscale s'more. Although the menu changes on an almost daily basis, vegetarians can count on finding enough flesh-free items to satisfy both tummy and taste buds. In addition to the beets, chickpeas, and sumac on crostini; the chèvre, fennel, and beets on baguette; and the potato salad, our menu featured a side of marinated artichokes and two meatless salads: organic greens with croutons and a parmesan vinaigrette, and a Greek salad with feta, garbanzos, cucumber, avocado, romaine lettuce, and red onion. And did we mention the whoopie pie?